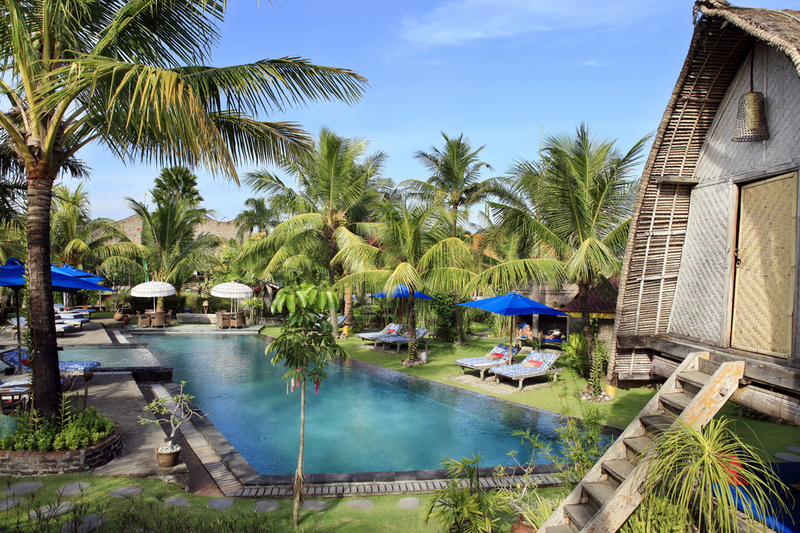 Bali served as the second, more relaxed home base of eclectic international fashion label KTZ. Bali may seem like an unlikely location for the operations of a global fashion enterprise. But for Marjan Pejoski and Sasko Bezovski, who co-founded the label KTZ (Kokon to Zai) in 2003, it's exactly that. The duo spent six months each year on the Indonesian island, where it runs an atelier. The rest of the time, they're based in London, where they operate another KTZ studio and hybrid music-and-fashion shop Kokon to Zai, the latter of which they opened in the city's Soho neighborhood in the mid-'90s. For the last decade or so, Pejoski and Bezovksi have made an average of four trips to Bali annually. "We never planned to work or move there," Pejoski says. "It just kind of happened spontaneously." The story of KTZ begins in 1989, wen Pejoski and Bezvksi met in Macedonia, and quickly became friends and then life-and-work partners. A year later, they moved to London, where Bezovski studied fashion at Central Saint Martins. Eventually, they opened a boutique called Kokon to Zai. "The shop gave us the opportunity to meet a lot of interesting people from the fashion industry," Pejoski says. Today, there are three Kokon to Zai locations – the second in Notting Hill in London, the third in Paris's 2nd arrondissement and the KTZ label is carried internationally at stores including Dover Street Market and Opening Ceremony. An antique sign outside of the Notting Hill location reads: "Universal Providers." It's an apt metaphor for the duo's lifestyle, as well as the store itself, which is situated in a former butcher shop dating back to a central ago. At the location, Pejoski and Bezovski have put a focus on primitive works and unusual objects – "It's almost like a curiosity cabinet from the 19th century," Pejoski says – as well as contemporary art and fashion accessories. "It gives us a playground to do other things apart from just fashion," he says. "Because we travel a lot, it's basically my living room filled with objects I collect and buy abroad. He continues, "If you think of the Kokon to Zai name itself, it means old and new, East-meets-West. With us, we travel around the world and never know what we're going to find. We always hope for new surprises, new challenges, always something new." The KTZ label, too, takes its multicultural inspiration from its founders' travels, largely in the form of indigenous designs and ethnographic references. Bali, though a home base, is just one of my places that influence them. As Pejoski put it, "It doesn't really matter if it's Bali or Japan or London or wherever – every season we're looking for another story, another place, another something." Bali has indeed become a part of Ktz's brand this. And though a development has increased on the island – "cranes are everywhere now, and it has become quite polluted,"Pejoski says – the natural beauty of the place still shines through. When there, he says, "we have more time for being close to nature and seeing greenery and the sea on a daily basis than in London. It gives you a space for being within yourself. There's more time to do yoga. Bali has helped in our development." And now, it has led to collaboration: This spring, KTZ will launch a custom T-shirt for the W Retreat & Spa Bali-Seminyak, where it will also present a surfboard-as-art installation in the hotel's foyer. To conceive of the shirt and surfboard designs, Pejoski turned to Balinese mythology, specifically the barong, a lionlike character that represents goodness. "In everybody's mind, whenever you mention Bali, it's the 'Island of the Gods,' he says. "I just took the barong on as a positive symbol." For many of KTZ's consumers, wearing a brand's clothes is its own sort of trip to a faraway land. For the fashion label's founders, their escape is the Island of Bali – the source of much of the line's creation. "I love Bali cliffs and the views," Pejoski says. "It gives you another dimension of freedom and space."